WNYT’s Benita Zahn visited Sunnyview Rehabilitation Hospital to speak with patient Sylvia Ellis about her health care journey, and discuss with SPHP Continuing Care President Kim Baker how Sylvia’s story highlights the efforts taken by St. Peter’s Health Partners to earn Integrated Care Certification from The Joint Commission. Getting patients out of the hospital faster and on the right track for recovery more quickly. That’s at the heart of a nationally recognized program offered by St. Peter’s Health Partners. It’s challenging for patients to wend their way through the health system — especially if they need ongoing care. That’s where the Integrated Care Coordination System comes into play at St. Peter’s Health Partners. A Loudonville woman shared her story of how this has literally helped her get back on her feet. Although she’s still needs help walking, the fact that Sylvia Ellis is walking is a testament to her will, and the therapy she’s gotten since a devastating car accident in June, 2017. “We have a group of registered nurses who accept a referral and then we take it from there. 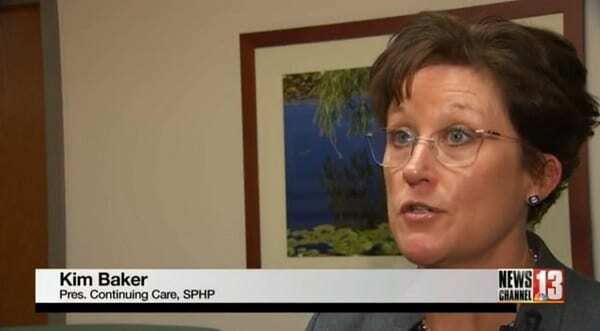 We guide the transition from a hospital to the best level of care for that individual to meet his or her needs,” explained Kim Baker, the president of continuing care at St. Peter’s Health Partners. By organizing care, patients can get back home more quickly – reducing the risk of a hospital acquired infection and improving their overall outlook – both facilitating recovery.